You receive an e-mail asking you how you are doing and then you see the word recommendation. You now know that the sender is asking you to write a recommendation letter. Let’s face it: Writing recommendation letters are a bit challenging. The thought of whipping up the right words to write about his/her achievements and strong attributes is making you nervous. Whether you were a former teacher, a counselor, or also a student, we have you covered. Our Sample Letters can help you write that letter of recommendation in no time. 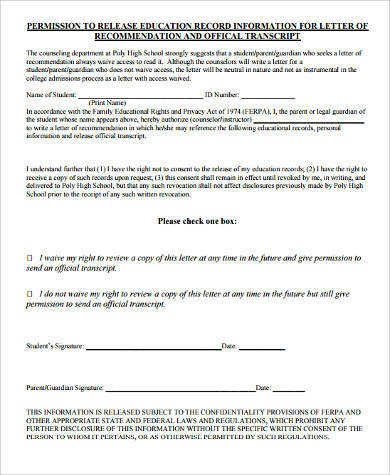 These eight sample student recommendation letters are available in .docx and .pdf formats and free for download and printing. Scholarships, colleges, and prestigious universities do not just rely on the grades, test scores, and resumes of the students. They want to know how rounded these students are when it comes to work ethic, personality, and experience. 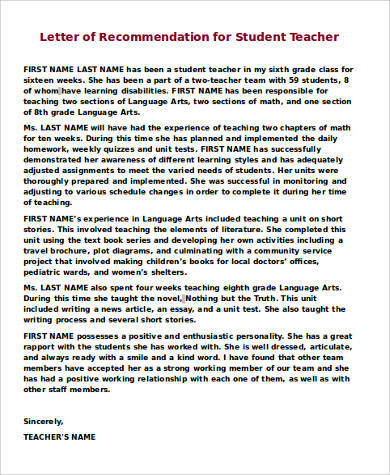 They want to ensure the quality of the student they are getting, which makes writing of recommendation letters crucial. 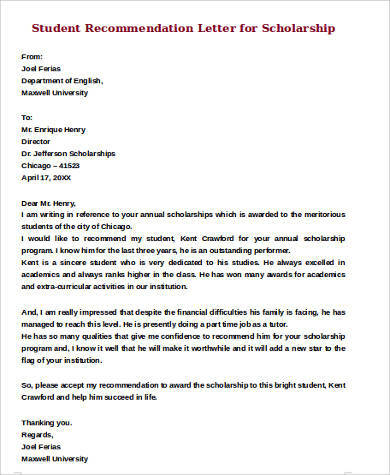 These letters give a brief introduction of the student and his achievements. 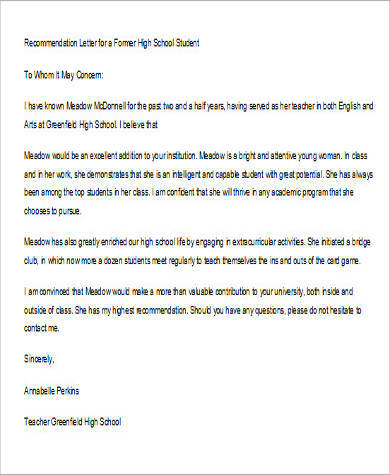 When you are asked to write a recommendation letter about a student, you want to make sure you do a great job. 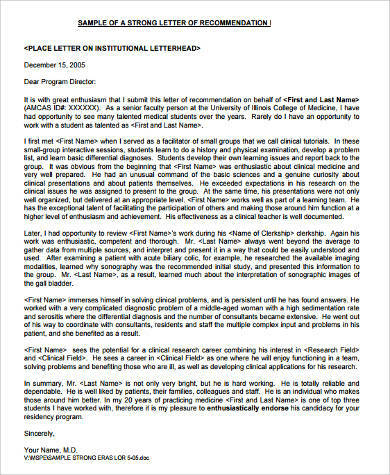 Recommendation letters share a common format. Header. This is where your name, title/position, company name, and address is cited. Introduction. This is the first paragraph and this is where you introduce yourself, how you are connected to the student, and why you are qualified to recommend the student. Sell the person you are recommending. This is where you sell the student you are recommending. You highlight the qualifications they have and you provide an in-depth detail of what he/she can contribute. Conclusion. You provide details of how you can be contacted in case they need any more information about the student. 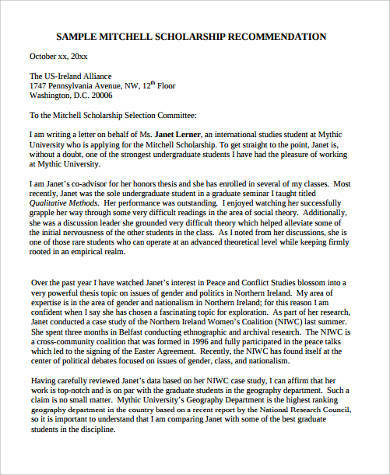 You can check out Example Letters of Recommendation to see more examples. Sound excited and enthusiastic in recommending the student. You should sound impressed and keen in helping the student achieve his/her goals. Don’t go overboard with highlighting the excellent attributes of the students. Make sure to cite specific examples to back up your claim. Discuss the personal and academic strengths of the student. You want to let the receiver know that the student you are recommending is who they are looking for. Take time to review the letter you are sending. 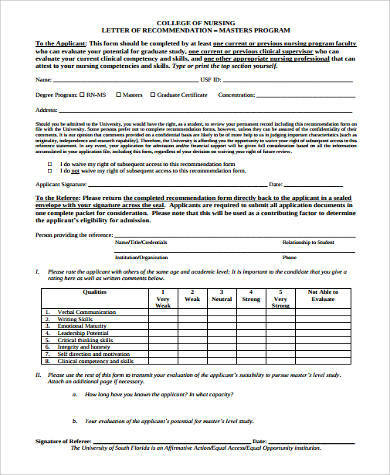 Our Recommendation Letter Samples will give you better ideas on how you can write recommendation letters. It will help the student you are writing for get a better chance at acquiring the scholarship he/she is aiming for or getting admitted in the best college or university that he/she aspires to be in.